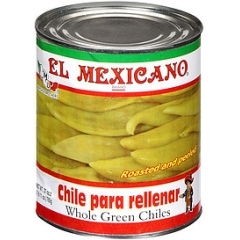 Home > El Mexicano Whole Green Chiles. 765gm. 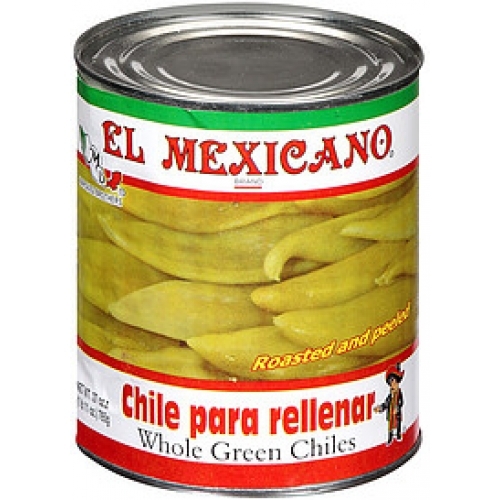 One 27 oz can of Whole Roasted and Peeled Green Chilis. Roasted, peeled and ready to cook with, these whole green chiles are essential for many authentic Mexican dishes. Make your own chili relleno, chili verde (green chili), or chop these chilis and add them to taco fillings, salsas, or add to any dish to add an authentic Mexican food flavor. These green chilis are mild to medium in heat, and do a wonderful job of adding real chili flavor without introducing too much heat to any dish.